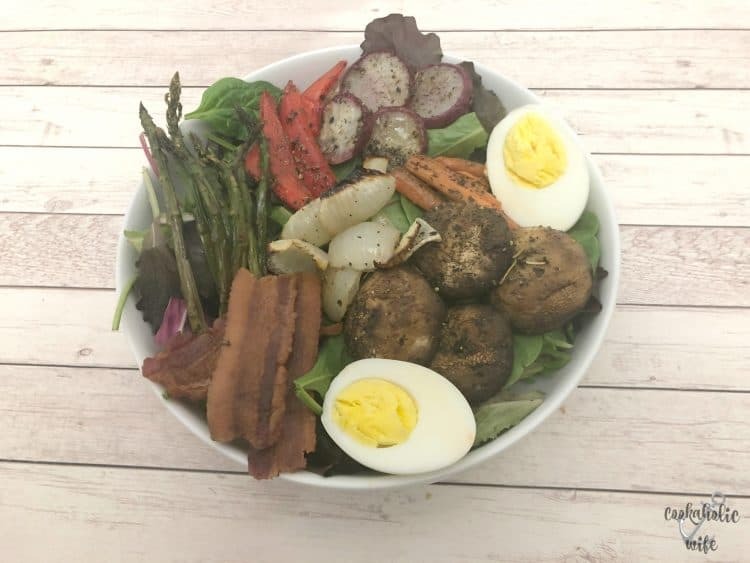 Roasted Veggie Cobb Salad is a flavorful salad full of roasted carrots, radishes, onions, mushrooms, bell peppers and topped with balsamic dressing. 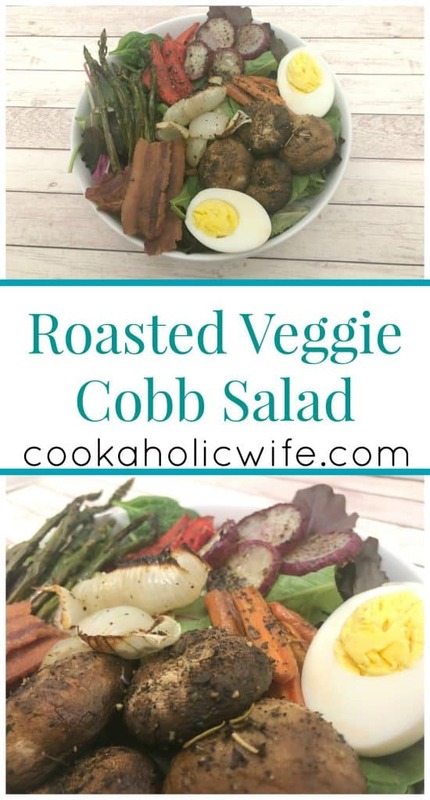 I am a huge fan of cobb salads. 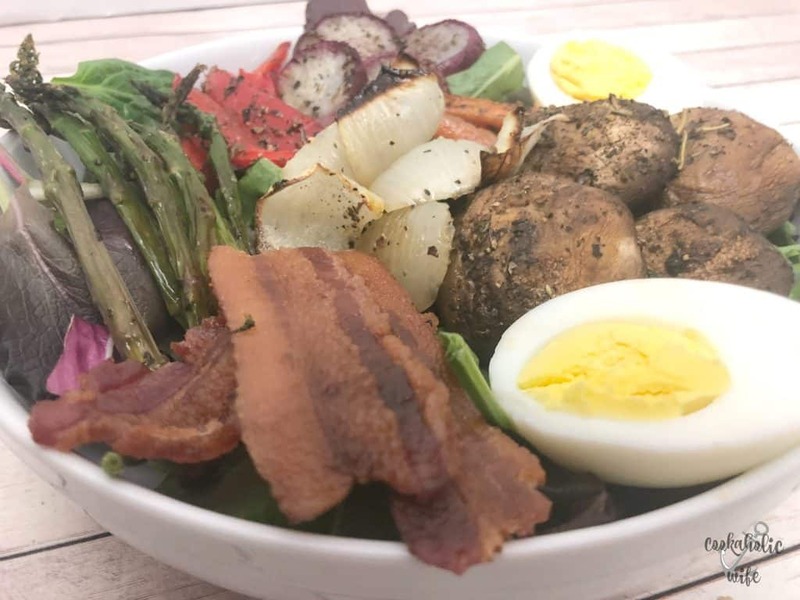 I love the combination of fresh vegetables, hard boiled eggs and bacon on top of salad because it’s so much more filling that way and can easily become a meal. This salad takes that up a notch by roasting a variety of vegetables first. You can easily replace the ones I chose with whatever you have in your fridge or to your personal tastes. 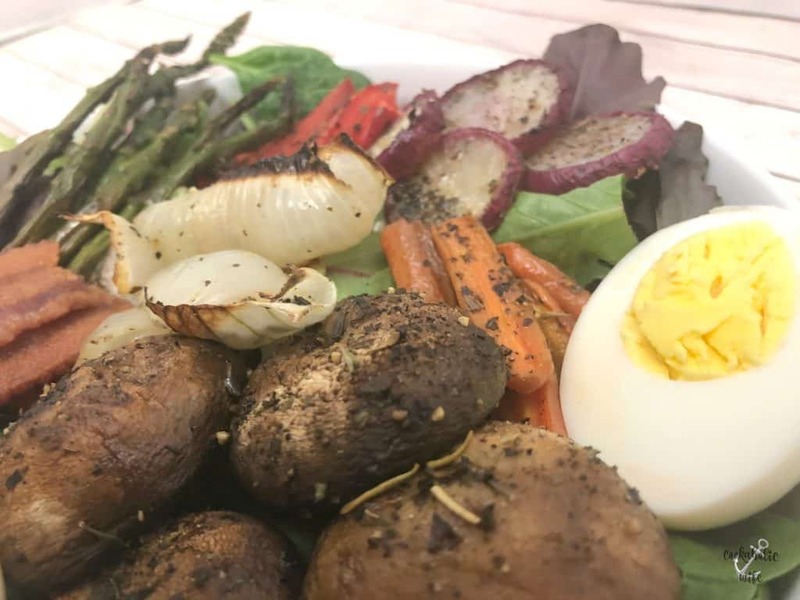 Roasting veggies is a great way to use up any of them that may be nearing the end of their life as well. Bell pepper about to get mushy? Mushrooms right at the end of their life? Toss them in olive oil and seasoning and pop them in a hot oven and you’d have no idea! I made this recipe for #BakingBloggers and the theme for this month is Baking (Roasting) with Spring Vegetables. I knew asparagus was going to make it’s way into this salad, but I wasn’t sure how roasting up radishes was going to go. If you’ve never had a roasted radish, I totally recommend it. They are delicious! I’d only ever ate them raw before this salad and while they’re good raw…they’re incredible roasted! If the idea of putting hot roasted vegetables on top of a salad makes you want to cringe, I’m right there with you. Unintentional wilted lettuce is just kinda weird, right? Let the vegetables cool for a few minutes before tossing them onto the salad or even refrigerate them and serve this later on as a completely cold salad. That’s one of the best things about roasted veggies – whether hot, room temp or cold, they’re still good! I chose to put balsamic vinegar on my salad but a vinaigrette would also work out. Or if you aren’t a fan of either of those, a light Italian dressing would be great too.